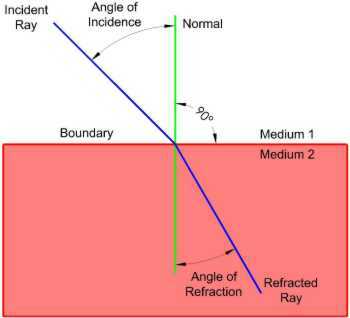 How much a ray bends depends on the indices of refraction of the two media, and can be described quantitatively by Snell's Law. The speed of light is reduced in the slower medium, and the wavelength is shortened proportionately. The frequency is unchanged, however, since frequency is a characteristic of the source of the light and is unaffected by medium changes. Image formation by lenses and the eye requires refraction. When a light wave encounters a new medium or an obstacle in its path, it can respond in various ways, and refraction is merely one of several of these possible boundary behaviors. A change in both the speed and wavelength of a light wave accompanies the transmission of light across a boundary between two media. The light wave will not only change directions at the boundary, but will also speed up or slow down and transform itself into a wave with a larger or a shorter wavelength. The only time that a wave can be transmitted across a boundary, change its speed, but not refract is when the light wave approaches a boundary from a direction that is perpendicular to the boundary. Whenever a light wave changes speed and approaches a boundary at an angle, refraction will be observed. Law 1. The incident ray, the normal line, and the refracted ray all lie in the same plane. is constant for light of a given color (i.e., frequency) crossing the boundary of two given media. This ratio is called the refractive index (n). The refractive index of a transparent substance is measured when light enters the substance from a vacuum, but for all practical purposes we can take it as light entering the substance from air. The greater the value of the refractive index, the more the light will bend. Refraction is caused by the fact that light travels at different speeds in different media; it can also be shown that the refractive index is equal to the ratio of the speeds in the two media. 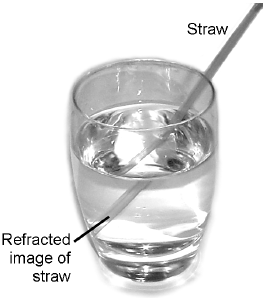 Want to know more about refraction? Click here to schedule a live session with an eAge eTutor!